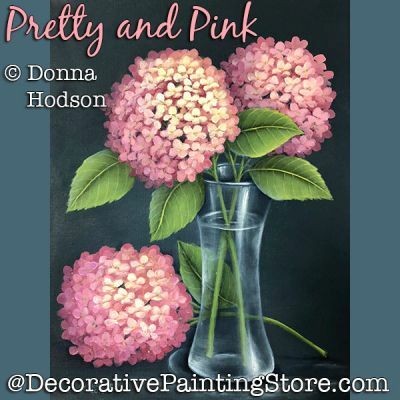 Pink hydrangeas are featured in a clear glass vase on a dark blue background. This is painted using DecoArt Americana Acrylic on a 9” x 12’ wrapped canvas. The packet includes complete directions, step by step illustrations and photos, finished photos, and two line drawings for 9” x 12” and 8” x 10” sizes.